A recent TOD post on reserve growth by Rembrandt Kopelaar motivated this analysis. 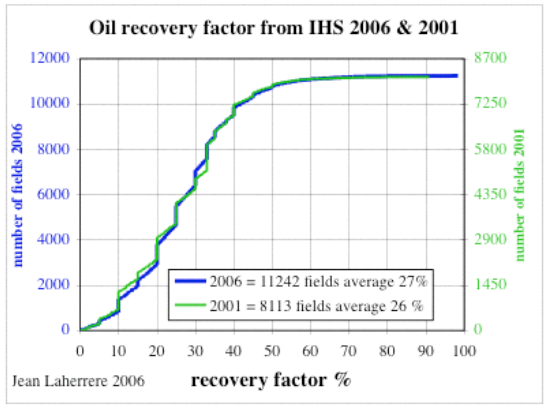 The recovery factor indicates how much oil that one can recover from the original estimate. This has important implications for the the ultimately recovery resources, and increases in recovery rate has implications for reserve growth. First of all, we should acknowledge that we still have uncertainty as to the amount of original oil in place, so that the recovery factor has two factors of uncertainty. 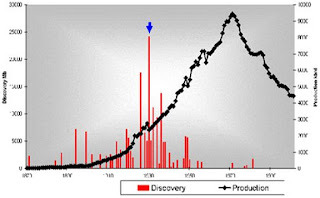 The cumulative distribution of reservoir recovery factor typically looks like the following S-shaped curve. The fastest upslope indicates the region closest to the average recovery factor. "Reserve growth tends to happen in bigger fields because thats where you get the most bang for your buck"
this makes sense as the recovery factor will extend for larger fields. the ratio Median/k indicates the fractional average recovery factor relative to the median field size. Rembrandt provided some recovery factor curves originally supplied by Laherrere, and I fit these to the Median/k fractions below. alongside the recovery factor model described here. Laherrere also provided curves for natural gas, where recovery factors turn out much higher. Figure 4: Recovery Factor distribution functions for natural gas. Note that the recovery factor is much higher than for oil. It looks like this derivation has strong universality underlying it. This remains a very simple and parsimonious model as it has only one sliding parameter. The parameter Median/k works in a scale-free fashion because both numerator and denominator have dimensions of size. This means that one can't muck with it that much -- as recovery factors increase, the underlying uncertainty will remain and the curves in Figure 2 will simply slide to the right over time while adjusting their shape. This will essentially describe the future reserve growth we can expect; the uncertainty in the underlying recovery factors will remain and thus we should see the limitations in the smearing of the cumulative distributions. To reverse the entropic dispersion of nature and thus to overcome the recovery factor inefficiency, we will certainly have to expend extra energy. This post either points out something pretty obvious or else it reveals something of practical benefit. You can judge for now. I briefly made a reference to bird survey statistics when I wrote this post on econophysics and income modeling. I took a typical rank histogram of bird species abundance and fit it the best I could to a dispersive growth model, further described here. The generally observed trend follows that many species exist in the middle of abundance and relatively small numbers of species exist at each end of the spectrum -- few species exceedingly common (i.e. starling) and few species exceedingly rare (i.e. whooping crane). Since the bird data comes from a large area in North America, the best fit followed a meta-community growth model. The meta-community adjustment impacts the knee of the histogram curve and broadens the Preston plot, effectively smearing over geological ages that different species have had to adapt. If we assume that the relative species abundance has a underlying model related to steady-state growth according to p(rate), where rate is the relative advantage for species reproduction and survival, then this should transitively might apply to disturbances to growth as well. Recently, I ran into a paper that actually tried to discern some universality in diverse growth papers, and it coincidentally used the bird survey data along with two economic measures of firm size and mutual fund size. Schwarzkopf, Yonathan, and J. Doyne Farmer, “The Cause of Universality in Growth Fluctuations.” Santa Fe Institute, (April 2010). Schwarzkopf, Yonathan, and J. Doyne Farmer. “Supporting Information — The Cause of Universality in Growth Fluctuations.” Santa Fe Institute. I did the best I could with the figures in the paper but eventually went to the source, ftp://ftpext.usgs.gov/pub/er/md/laurel/BBS/DataFiles/, and used data from 1997 to 2009. Sure enough, and for whatever reason, the "growth" in the surveyed data does show as much richness as the steady state averaged abundance distribution. The relative growth in terms of a fractional yearly change sits alongside the relative abundance curve below (in green). Notice right off the bat that the distribution of fractional changes drops off much more rapidly. I believe that this has a simple explanation having to do with Poisson counting statistics. When estimating fractional yearly growth, we consider that the rarer bird species having the lowest abundance will contribute most strongly to fluctuation noise on year-to-year survey data. Values flipping from 1 to 2 will lead to 100% growth rates for example. (We have to ignore movements from 1 to 0 and 0 to 1 as these growths become infinite. The term 1.4/sqrt(N) derives from Poisson counting statistics in that the relative changes become inversely related to the size of the sample. We double count in this case because we don't know whether the direction will go up or down, relative to R, a number close to unity. Expanding on the scale, the results of this algorithm are shown in Figure 3. Placing it in terms of a binned probability density function, the results look like the following plot. Note the high counts match closely the data simply because the 1/sqrt(N) is relatively small. Away from these points, you can see the general trend develop even though the data is (understandably) obscured by the same counting noise. Figure 4 : The probability density function of yearly growth fluctuations. As an essential argument to take home, consider that a counting statistics argument probably accounts for the yearly growth fluctuations observed. Before you make any other assertions, you likely have to remove this source of noise. Looking at Figure 3 & 4, you can potentially see a slight bias toward positive growth for certain lower abundance species. This comes at the expense of lower decline elsewhere, except for some strong declines in several other low abundance species. This may indicate the natural ebb and flow of attrition and recovery in species populations, with some of these undergoing strong declines. I haven't done this but it makes sense to identify the species or sets of species associated with these fluctuations. Two puzzling points also stick out. For one, I don't understand why Schwarzkopf and Farmer didn't immediately discern this effect. Their underlying rationale may have some of the same elements but it gets obscured by their complicated explanation. They do use a resampling technique (on 40+ years worth of data) but I didn't see much of a reference to conventional counting statistics, only the usual hand-wavy Levy flight arguments. They did find a power law of around-0.3 instead of the -0.5 we used for Poisson, so they may generate something equivalent to Poisson by drawing from a similar Levy distribution. Overall I find this violates Occam's razor, at least for this set of bird data . Secondly, it seems that these differential growth curves have real significance in financial applications. More of the automated transactions look for short duration movements and I would think that ignoring counting statistics could lead the computers astray. As an aside, when I first pulled the data off the USGS server, I didn't look closely at the data sets. It turns out that the years 1994,1995,1996 were included in the data but appeared to have much poorer sampling statistics. 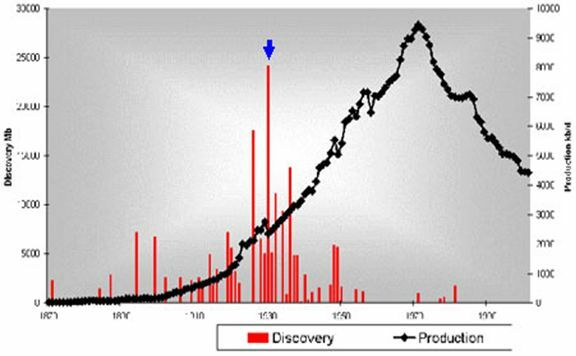 From 1994 to 1996, the samples got progressively larger but I didn't realize this when I first collected and processed the data. Figure 6 : CDF of larger data sample. Note the strange hitch in the data growth fluctuation curve. At the time, I figured that the slope had a simple explanation related to uncertainties in the surveying practice. I also saw some similarities to the uncertainties in stock market returns that I blogged about recently in an econophysics posting. On a cumulative plot as in Figure 6, this shows a power-law of order 2 (see the orange curve). Near the knee of the curve, it looks a bit sharper. If we use a uniform distribution of px(x) up to some maximum sample interval, then it matches the knee better (see the dashed curve). So the simple theory says that much of the observed yearly fluctuation may arise simply due to sampling variations during the surveying interval. Plotting as a binned probability density function, the contrast shows up more clearly in Figure 7. In both cases is fit to X/T = 60. This number is bigger than unity because it looks like every year, the number of samples increases (I also did not divide by 15, the number of years in the survey). But of course, the reason this maximum entropy model works as well as it does came about from real variation in the sampling techniques. Those years from 1994 to 1996 placed enough uncertainty and thus variance in the growth rates to completely smear the yearly growth fluctuation distribution. Figure 7 : PDF of larger sample which had sampling variations. Note that this has a much higher width than Figure 4. Only in retrospect when I was trying to rationalize why a sampling variation this large would occur in a seemingly standardized yearly survey, did I find the real source of this variation. Clearly, the use of the Maximum Entropy Principle explains a lot, but you still may have to dig out the sources of the uncertainty. Can we understand the statistics of something as straightforward as a bird survey? Probably, but as you can see, we have to go at it from a different angle than that typically recommended. I will keep an eye out if it has more widespread applicability; for now it obviously requires countable discrete entities. One pattern that has evaded linguists and cognitive scientists for some time relates to the quantitative distribution in human language diversity. Much like how plant and animal species diversify in a specific pattern, with very few species dominating within an ecosystem and relatively few species exceedingly rare, the same thing happens with natural languages. You find a few languages spoken by many people, and very few spoken seldomly,with the largest number occupying the middle. This form derives from the application of the maximum entropy principle to any random variate where one only knows the mean in the growth rate and an assumed mean in the saturation level. I refer to this as entropic dispersion and have used this many applications before so I no longer feel a need to rederive this term every time I bring it up. The key to applying entropic dispersion is in understanding the growth term g(n). In many cases n will grow linearly with time so the result will assume a hyperbolic shape. In another case, an exponential growth brought up by technology advances will result in a logistic sigmoid distribution. Neither of these likely explains the language adoption growth curve. Intuitively one imagines that language adoption occurs in fits and starts. Initially a small group of people (at least two for arguments sake) have to convince other people on the utility of the language. But a natural fluctuation arises with small numbers as key proponents of the language will leave the picture and the growth of the language will only sustain itself when enough adopters come along and the law of large numbers starts to take hold. A real driving force to adoption doesn't exist, as ordinary people have no real clue as to what constitutes a "good" language, so that this random walk or Brownian motion has to play an important role in the early stages of adoption. So with that as a premise, we have to determine how to model this effect mathematically. Incrementally we wish to show that the growth term gets suppressed by the potential for fluctuation in the early number of adopters. A weaker steady growth term will take over once a sufficiently large crowd joins the bandwagon. Plotting this for C=0.007 and K=0.000004, we get the following growth function. This makes a lot of sense as you can see that growth occurs very slowly until an accumulated time at which the linear term takes over. That becomes the saturation level for an expanding population base as the language has taken root. I took two sets of the distribution of population sizes of languages (DPL) of the Earth’s actually spoken languages from the references below and plotted the entropic dispersion alongside the data. The first reference provides the DPL in terms of a probability density function (i.e. the first derivative of P(n)) and the second as a cumulative distribution function. The values for C and K were as used above. The fit works parsimoniously well and it makes much more sense than the complicated explanations offered up previously for language distribution. Figure 2 : Language diversity (top) probability density function (below) cumulative. The entropic dispersion model in green. In summary, the two pieces to the puzzle are assuming dispersion according to the maximum entropy principle, and a suppressed growth rate due to fluctuations during the early adoption. This gives two power law slopes in the cumulative; 1/2 in the lower part of the curve and 1 in the higher part of the curve. Discussions on the fluctuation term. "So much of math is about noticing patterns," says Stern, who should know. Before becoming a teacher, he was a finance analyst and a quality engineer. I always try to seek interesting patterns in the data, but more to the point, I try to actually understand the behavior from a fundamental perspective. One way Stern uses technology is by helping his students visualize his lessons through the use of graphing calculators. Stern has it exactly right, if we treat knowledge seeking as a game, like a suduko puzzle, we can attract more people to science in general. 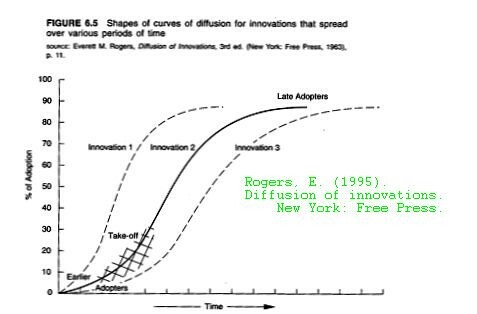 I think that the pattern in language distribution has similarities to that of innovation adoption as well, similar to what Rogers describes in his book "Diffusions of Innovations". I will try to look into this further as I think the dispersive arguments holds some promise as an analytical approach. Games for suits. This post has no relevance in the greater scheme of things. As a premise, consider that the financial industry needs instruments of wealth creation that work opposite to that of stocks. For example, when stock prices remain low, then something else else should take up the slack -- otherwise important people won't make money. Wall Street invented derivatives, options, and other hedging methods to serve as an investment vehicle under these conditions. We can try to show how this works. If S is the stock price, then V ~ 1/S is an example "derivative" that works as a reciprocal to price. This becomes the normative description and defines the basic objective as to what the investment class wants to achieve -- an alternate form of income that balances swings in stock price, potentially reducing risk. Further, we make the assumption that the derivative will grow or decline over time. If a > 0 then the derivative will grow and if a is less than zero than the derivative will damp out over time. The term K is a constant of proportionality. The particulars may change but this formulation describes THE equation that Merton, Black, and Scholes devised to aid investors in making hedged investments using options and other derivatives. The way to read this equation is to note that derivatives will drift or diffuse into the space of the stock price, and proportional to the stock price itself. The drift term occurs due to the interest rate r providing a kind of forcing function. The derivative, V, can also grow due to pure interest rate compounding, as seen in the last term. Whether this actually holds or not, I don't really care as I don't participate in these schemes. To verify this assertion, we test the expression in the B-S equation, substituting the partial derivatives as we go along. The term r is proportional to interest, and σ is volatility or variance in stock price. Note that if the volatility (i.e. diffusion) stays high relative to interest, the exponential will damp out with time. If interest (i.e. drift) goes higher than volatility, the exponential will accelerate, creating a huge amount of paper gains. At this point someone will argue that this solution does not reflect reality. I beg to differ. When you make your bed of mathematical box-springs, you have to lie in it. This solution to Black-Scholes is perfectly fine as it gives a steady-state picture of the partial differential equation. The diffusional and drift components cancel with the right mix of production vs destruction in derivative wealth. If you don't like it, then come up with something different than that specific B-S equation. I have a feeling that all the seeming complexity of financial quantitative analysis with its Ito calculus and Wiener processes acts as a shiny facade to a simple reality. The math exists to model the inverse relationship of stocks to derivatives. If this didn't happen -- and the lords of high finance absolutely require this relationship to make money -- the math as formulated would vanish from their toolbox. In other words, the math only exists to justify what the financial operatives want to see happen. Everyone appears to implicitly buy this mathematical artifice hook, line, and sinker. Quantitative analysis and the "quants" who work it have created a fantasy land, where they do not want you to know how easily their quaint ornate universe reduces to a simple function. If they admitted to the charade, the mystery would all disappear and they would no longer have jobs. Economics and finance does not constitute a science. In science you may need to use partial differential equations. For example, the Fokker-Planck equation shows up quite often -- which incidentally, the Black-Scholes equation shows some similarity to and the quant proponents of B-S certainly like to play up -- but it typically applies to real, physical systems where you use it to try to understand nature, not trying to model some artificial game-like behavior. I can edit my solution into the Wikipedia page for Black-Scholes and I will bet that someone will immediately remove it. I harbor no illusions. The financial industry depends on the absence of real knowledge to achieve their objectives. That explains why economics and finance do not classify as sciences; absolute truth does not matter to economists and financiers, only the art of deconstructing profit and the craft of phantom wealth creation does. Please address editorial comments to: Postings, Main Incinerator, Department of Sanitation, North River Piers, New York, N.Y. 10019.